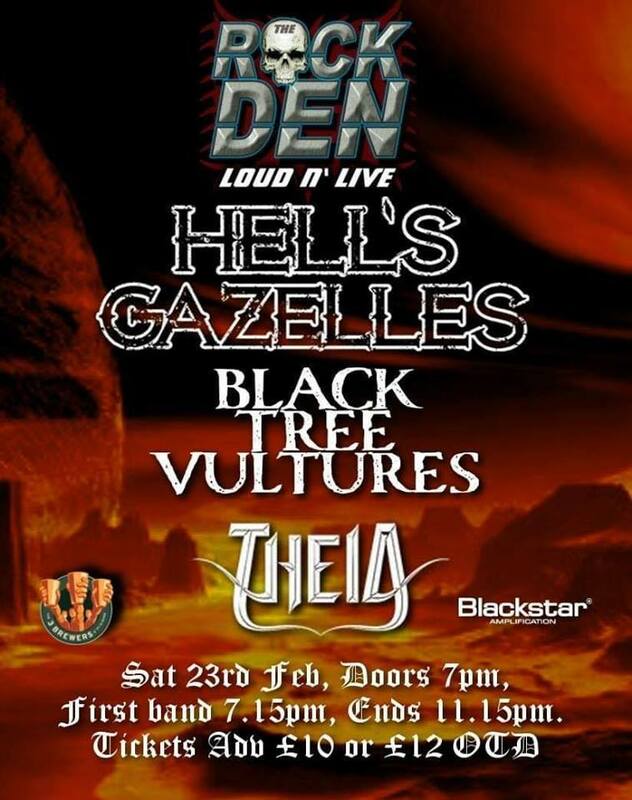 THEIA and Black Tree Vultures make their Rock Den debut alongside a Den favourite in Hell’s Gazelles. “I listened to the stuff I was sent by THEIA and thought- there has to be some sort of mixing going on here, something else going on, they can’t do this live at their age… so I went and saw them live. Holy s*** man, they are as good live, they’re amazing! You’re going to love them.” David Tonge- Noize Level Critical. Formed in early 2017 by Jonno Smyth (Drums) and Aaron ‘Ham’ Hammersley (Guitar), Black Tree Vultures set out to combine their classic metal influences with a modern edge, to play to an audience ranging from seasoned metal veterans to new rock lovers. After recruiting Celyn Beynon (Vocals) to front the band, writing and recording began on their debut EP “Sanity Isn’t Perfect”. This was released on BTV records via plastic head media in February 2018. The band crafted a strong live set and immediately took to the road, playing towns such as Oxford, Birmingham, Southampton & Colchester. Receiving great receptions wherever they went the band landed their first main support slot for Snakecharmer a few weeks before their debut E.P was released. Continuing to play live around the UK, Black Tree Vultures have supported the likes of Diablo Blvd, Bigfoot, Devilskin and Ryders Creed. The band soon found themselves in Europe to play live in Holland, Germany and Belgium. This included a Headline spot at the Dutch festival “Wolluk-Stock”. With their big riffs, soaring vocals, and frenetic live performances, Hard rockers Hell’s Gazelles have been tearing up the rock scene of late with a killer live show and an impressive catalogue. With slots at festivals such as such as Bloodstock, Amplified, the HRH Roadtrip and Giants of Rock under their belt, Hell’s Gazelles are fast becoming one of the UK’s premier up-and-coming live rock acts. The band’s recent EP ‘Take your Medicine’ received overwhelmingly positive reviews across the board. Kerrang said: ‘Killer riffing and soaring, swaggering vocals…Hell’s Gazelles mean serious business… Take your Medicine is a pill you’re going to want to swallow…’. Hell’s Gazelles do their utmost to get an audience riled, so expect a blood pumping, headbanging Rock n’ Roll show you’ll never forget.